Food and beverage business is very dynamic; full of new and fascinating idea. Some classic concepts are as interesting as the new ones if they are delivered right. One of the famous classic concepts in Indonesia is Peranakan Chinese restaurant. Peranakan are Chinese immigrant that already assimilated with Nusantara people and culture. Their food has the almost same characteristic as in China, but they use Nusantara spice. Some examples of their dish are Nyonya Laksa, Ayam Kapitan, and Kue Bulan. To make Chinese Peranakan restaurant gains more popularity, speak not only through the food, but also through the ambiance. The good ambiance is created from many aspects, one of which is the interior design. Peranakan Chinese design is very complex, yet that what makes it unique and splendour. Here are some of the ideas to decorate your Peranakan Chinese restaurant. Peranakan Chinese design is related with bold-coloured wall and ornaments, especially in red and gold. Red symbolizes dynamic, happiness, positivity, and good luck while gold symbolizes money and good luck. Using those colours on the wall can give bold Chinese ambience to your restaurant. However, if you think those colours are too bold, having them as the accent is also nice. Using red for your cushion, lamp cover, or other elements and gold for painting or picture frame are some of good examples. Chinese furniture mostly uses wood as material. Some special wood such as rosewood and mahogany are popularly used in the past. These woods make the furniture durable, insect and rot resistant, and smell good when it is new. Using old-looked Chinese furniture improves the looks of Chinese Peranakan restaurant since Chinese Peranakan is associated with old design. Antique Chinese furniture is divided into two broad categories. The first is from Ming Dynasty and the second is from Ching Dynasty. Ming furniture is more elegant and natural; embracing the beautiful texture of the wood. In contrary to that, Ching furniture is more colourful, larger, and full of beautiful engraving. China is renowned for their carvings and ornaments. They are ancient, complex, and majestic. Some Chinese wood carvings are gilded with gold colour while some are showing their natural colour, but of course they are covered with thick lacquers that make them smooth. However, the designs are mostly complicated. It can talk about Chinese everyday life, resemble beautiful ornaments such as flowers and vine, to show mythology creature such as dragon and phoenix. Not only wood; jade, bamboo, and brick can also be carved into wonderful ornaments. Some ornaments also makes central of attention. Earthenware such as jar and plates with Chinese design enhanced oriental theme of the restaurant. Long fabrics with coloured Chinese antique design will make astounding accent in your restaurants as well. 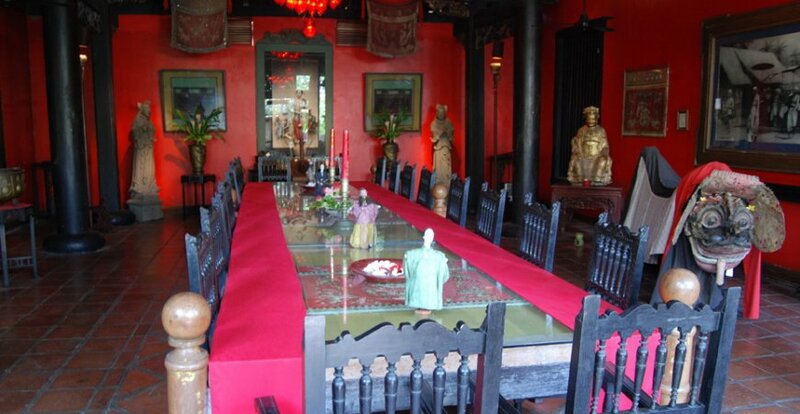 Chinese Peranakan settled in Nusantara since 15th-16th century, thus they are associated with old ethnic ambience. Playing old Chinese music as background can help with back to the past feeling. Displaying collections of antique statues and ornaments that are truly used in the past can instantly enhanced the sense of ancient times. Using historical elements will also elevate the characteristic of the restaurant. Photographs and paintings that illustrate “tempo doeloe” theme, especially which are related to Chinese culture in Indonesia, makes the perfect elements for your Chinese Peranakan restaurant. Now that you know the key of designing Chinese Peranakan restaurant, are you ready to design yours? Good interior design will contribute a lot in building the whole cozy atmosphere. It will bring satisfaction to the customer and absolutely generate more profit. Thus, your ideas and creativity in creating cozy atmosphere at your restaurant is one of the most important investments.